This was a dyeing experiment. It's not perfect, but I still like it. I was inspired by Carolyn's red velveteen skirt. 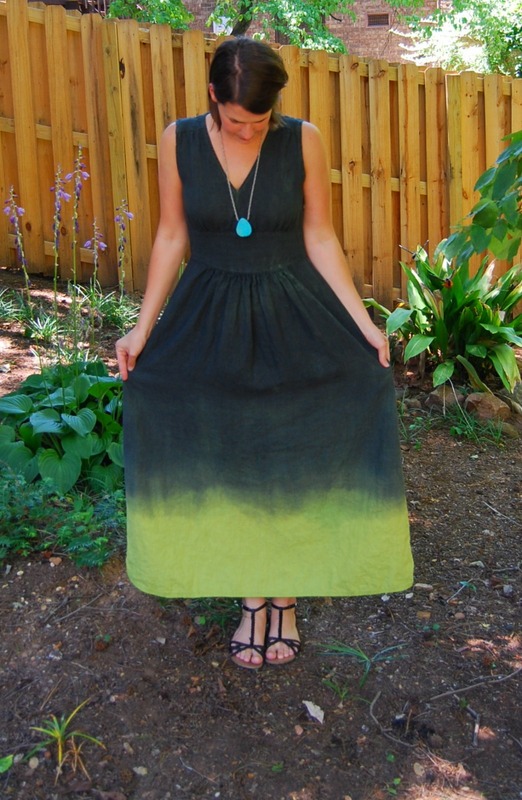 Of course I thought the dip dyeing was cool, but what I really liked was that she over-dyed her skirt. Over-dyeing is so unusual and unpredictable. I like the muddy, earthy colors that are created. I've done a fair bit of dyeing lately. Mostly on things from my closet that were not worn for various reasons. 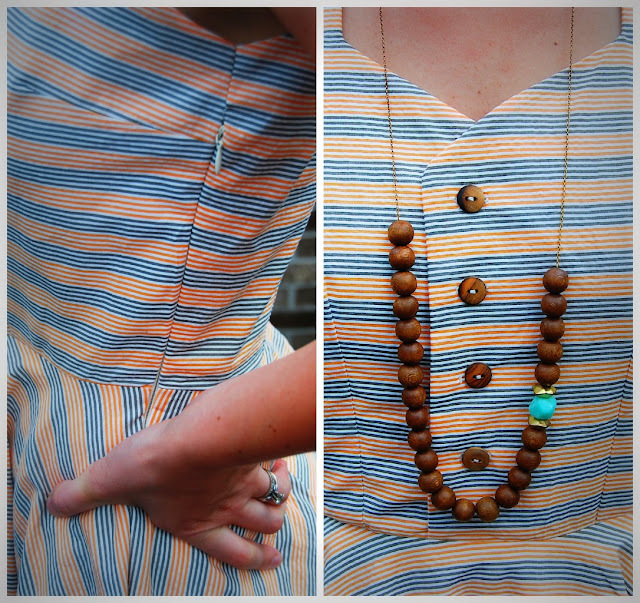 It's a nice way to change an unloved garment in to something wearable. But this is the first time I sewed a garment solely for the purpose of dyeing it. Here it is before dyeing. It looks radioactive, doesn't it? It is the brightest lime green I've ever seen without being fluorescent. This was a case of colors may not be accurate on your computer monitor. I ordered it online last summer and was shocked when it arrived. It's nice quality stuff- a heavy but soft linen. But I couldn't think of any item of clothing I wanted in electric lime green. Enter Carolyn's skirt. I instantly thought of this electric linen when I read her post. I knew if I over-dyed it I would end up with an earthy, much more pleasant color. But I was still surprised with how it turned out. Here is my hillbilly dip dye set up. This is my best impression of MacGyver. I tied the hem of the dress to a hanger and then tied the hanger to a rope. You can't see in the photo, but I strung the rope up through the handles on the cabinets above my slop sink. 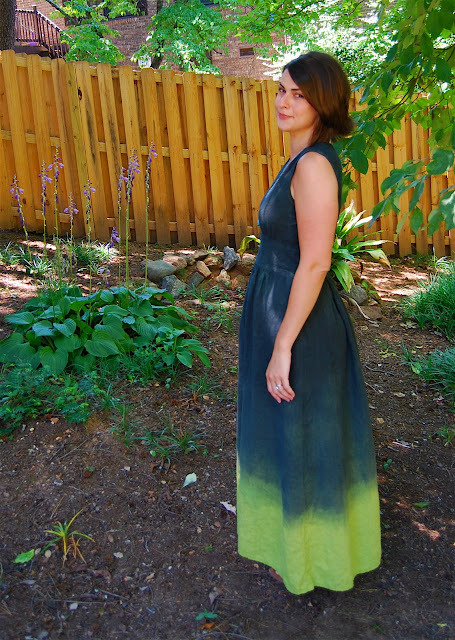 Then I pulled on the rope to dip the dress in to the dye bath to get the ombre effect. It was much easier than wearing out my arms. I used Rit dye, navy blue. Speaking of Rit dye, have you seen their color formula guide on their website? Pretty neat. After I dipped for a while, I let just the bodice sit in the dye bath for about thirty minutes. Unfortunately, it didn't exactly work. You can see my dress is pretty splotchy, though the splotches are subtle. I think the problem was that my bucket was not big enough. The dress didn't have enough room to move around freely in and the dye did not settle in evenly where there was a lot of gathering. So it looks a little bit homemade (or home-dyed). But I still think it's cool. I love the dull greenish black. Not what I was expecting, but then you never really know what to expect when over-dyeing. That and the fact that it's made out linen gives it a distressed sort of look. I'll never iron it, by the way. I like the way it looks wrinkly. Maybe I'll try dyeing it again to get rid of some of those splotches. 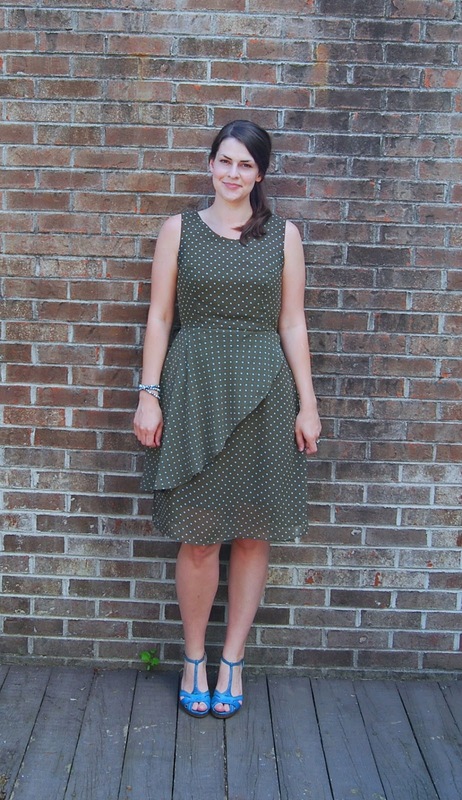 I used Simplicity 1801, a Cynthia Rowley pattern. I skipped the facings and bound the neckline and sleeve edges with bias. I closed the neckline up quite a bit higher. It's one of those so low you can see your belly button v-necks. I also nipped and tucked the bodice/midriff at the side seams and the center front seam. Beware that there is a lot of ease in this pattern. I'd love to make the version with sleeves at a later date. The gathering at the belly isn't too unflattering, is it? I feel like I should be at some sort of outdoor festival in this dress. Which is why I ventured down in to the yard for pictures. I needed some greenery. I have no idea what sort of plants are in this photo. The previous homeowner was a landscaper and every spring all sorts of things pop up in our backyard. It's kind of fun to see what's out there. What about you? Have you ever dip dyed anything? Any methods for successful dip dyeing? Does this look too homemade to wear out and about? Ok, I just have to say- holy cow, that was fun. That was a wildly successful giveaway post, mostly due to it being posted on A Fashionable Stitch. (Thanks, Sunni!) I was worried that I'd hear crickets when I hit publish the other day, but I had a hundred comments. How cool is that? Fun stuff. J thinks it's funny that so many people around the world have now read about the beetle. And baby sloths. The internet is a crazy (and fun) place. I've been google searching all the baby animals you guys mentioned all weekend. I have to say, baby llamas are pretty darn cute. And, of course, puppies. I have to concede to puppies. Ok, well all baby animals are cute. Anyway, let's get down to business. Originally I was going to put everyone's name in a hat and draw one out, but... Instead I did the old random number generator. The screen shot is kind of silly, but here it is anyway. I excluded two because one commenter didn't want to be entered and one was a double comment. Gillian, I'll be emailing you shortly. 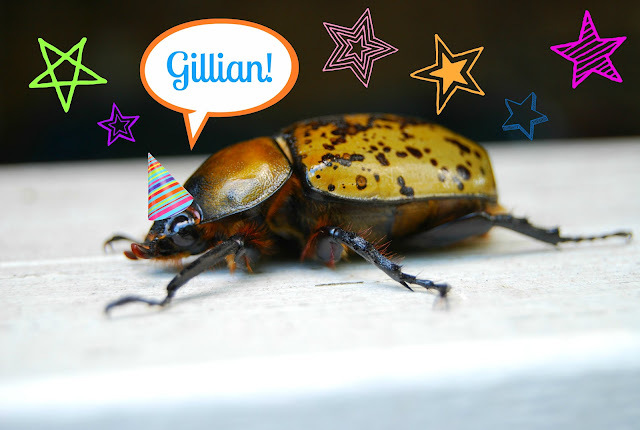 The beetle has packed his bags and has his party hat on. He's ready to go. Thanks, everyone for entering. I've said it once but I'll say it again- the sewing blogiverse is pretty awesome. If you can make it through this post, you'll be rewarded with a giveaway. This is like a blog obstacle course of randomness. First up, look at this crazy beetle. The photo doesn't do justice to the size of this thing. It was huge. J found it at work. He scooped it up in a plastic cup and covered the top with a napkin and rubber band. His work commute takes an hour. During the car ride home, the beetle ATE THROUGH THE NAPKIN AND ESCAPED. That's like my worst nightmare-- having a killer beetle loose in the car with me when I'm unable to pull over. Anyway, he put it in the cup holder and closed the lid (lucky there was a lid) and was totally excited to show it to me when he got home. 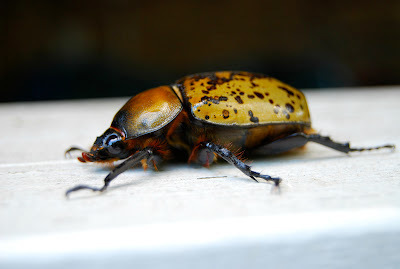 J, I love you, but I don't share your excitement for big scary beetles. Moving on. So I'm on summer break. Hands down the biggest perk of being a teacher. I've actually been off for two weeks now and I've done nothing. Absolutely nothing. I spent the first week of summer growing moss on the couch watching HBO on demand. I only took breaks to go outside and water things. What is it about too much free time? I've turned in to a sloth. I think I do better when I'm really busy. I know, I know. You can roll your eyes at me. Speaking of sloths, have you seen this baby sloth video? There are actually several clips of those baby sloths doing different things from an Animal Planet TV show. They may just be the cutest baby animal ever. I'll fight whoever disagrees. I am seriously contemplating saving money to go to Costa Rica just so I can go that sloth sanctuary. Watching baby sloth videos is another byproduct of too much free time. And finally, the end. You've made it to the reward. It wasn't all that random, was it? I thought I did a pretty good job of linking it all up. My friends, I am an idiot. I hurried off to Hobby Lobby the other day for their Simplicity pattern sale to buy 1880 for Sunni's sewalong. I bought another pattern, too. Only I came home and discovered that I already bought both patterns a month ago. So I want to give them away, both as a single prize. They are both the upper size range, 12-20 I believe, uncut and in factory folds. I didn't want them to be unused and unloved. No rules to this giveaway. Just sharing the love. Actually, I hope someone wants them. I'll feel silly if no one is interested. I've never done a giveaway before yet I've really enjoyed winning other people's giveaways. I shouldn't be so selfish. Leave me a comment with your email address if it's not already attached to your profile. I'll randomly pick a winner on Sunday, June 24th and email the winner for her address. I'll mail it as soon as possible in case the winner would like to keep up with the sewalong. I'll send it anywhere in the world. And if you can tell me a baby animal that's cuter than a baby sloth, I'll throw in something really spectacular. Something truly extraordinary. Something that will make you the envy of the neighborhood. 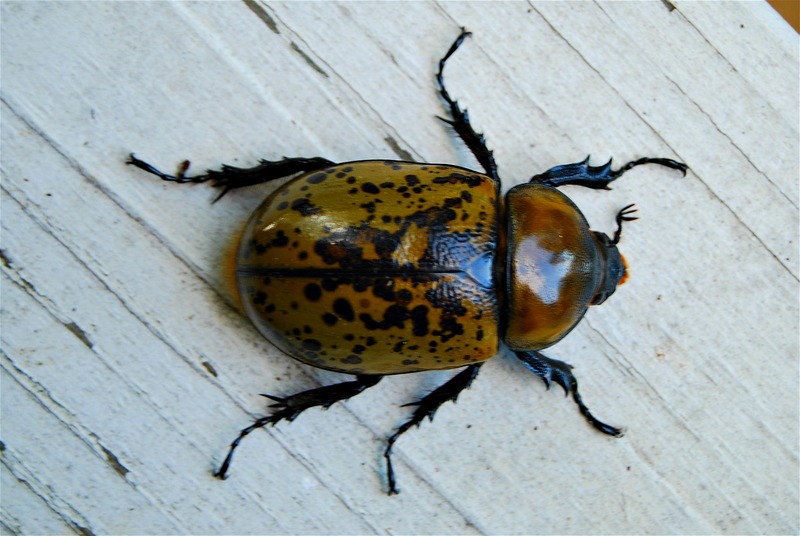 You're very own scary beetle! Hopefully it won't eat through the envelope. We set it free in case you were wondering. Incredibly creative title, huh? I was at a loss. 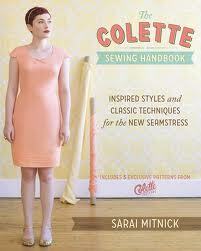 I tried to hold out and not purchase The Colette Sewing Handbook right away. Not because I didn't want to, but because I'm on a strict sewing budget. I only allow myself a certain amount each month to be spent on sewing goodness. That usually gets spent on fabric. Oh, how I love this dress. I really like rayon. Like really, really like rayon. Stephanie just did a fascinating post on rayon. 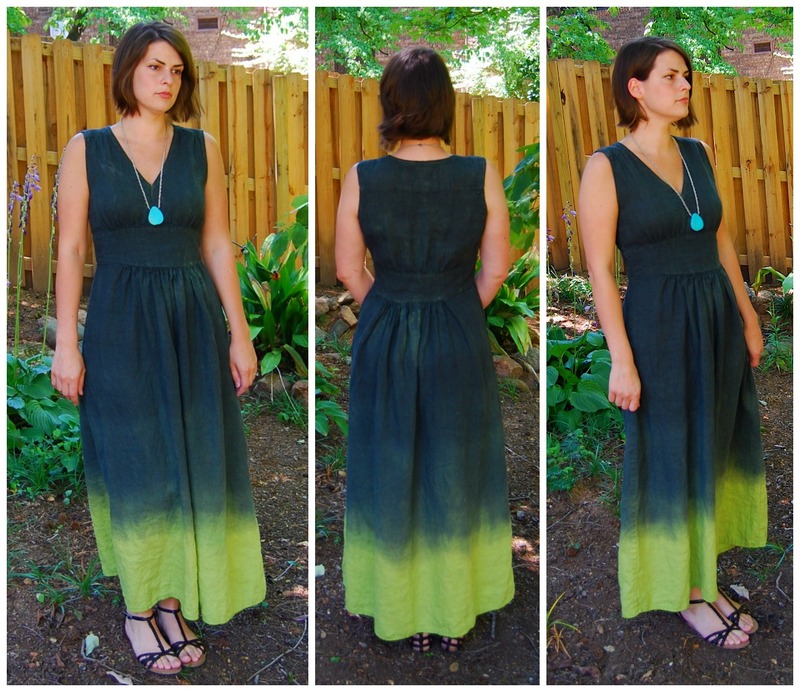 I love those posts she does on fabric types. I think it may be my favorite fabric to wear. Not necessarily to work with, but wearing- yes. I like that it's drape-y and silky without being too thin. I like drape-y fabrics but not when you can see all the lumps and bumps beneath. 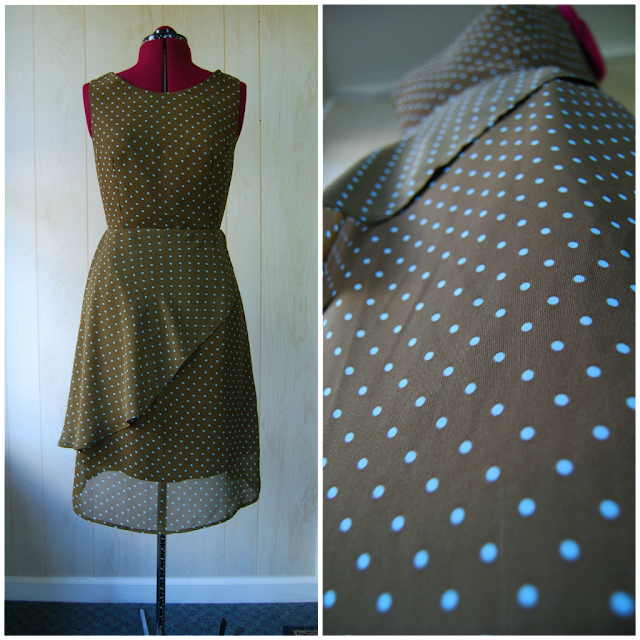 I used a solid brown rayon challis for the lining and a sheer polka dotted rayon blend for the shell. I'm sure the "blend" part means polyester but let's not dwell on the negative. The polka dot fabric is actually an army green color, although it reads more brown in photos. Partly because of the lining, I'm sure. It's a very muddy green. I did make a few changes to the bodice. 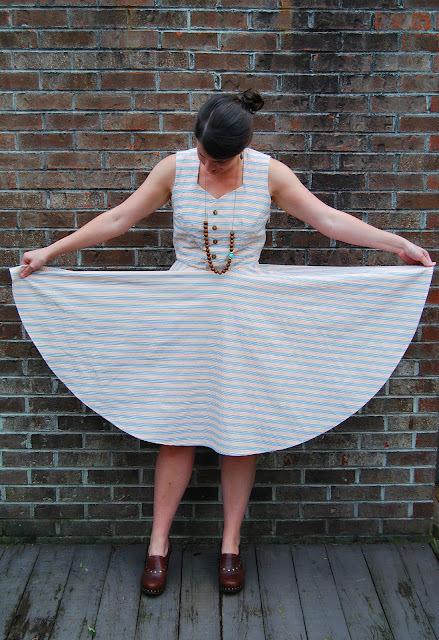 For one, I cut it two sizes smaller than the skirt portion. I also straightened and raised the back neckline a couple of inches. The neckline was initially very wide. I know I still have some back fit issues, but I think this is better than the last dress I made. The bodice portion is actually three layers of fabric. 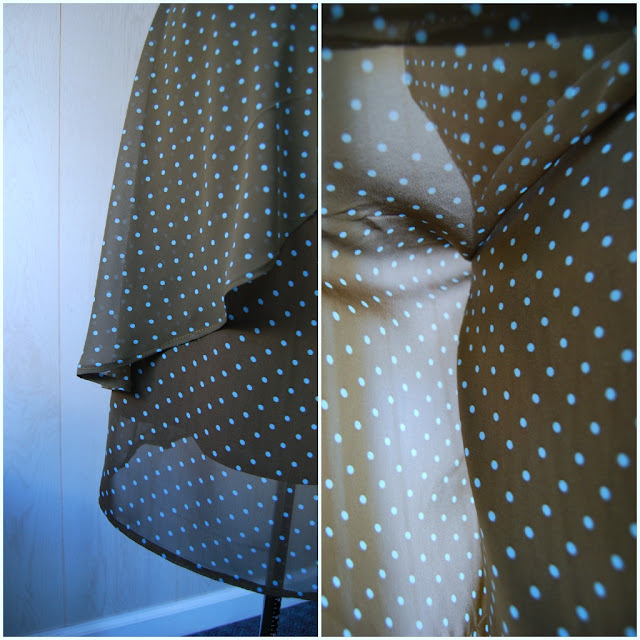 I underlined the sheer polka dot with a layer of rayon challis. Then I used another layer of rayon challis as a lining. I used the "pull through the shoulder seams" method of lining as seen here. 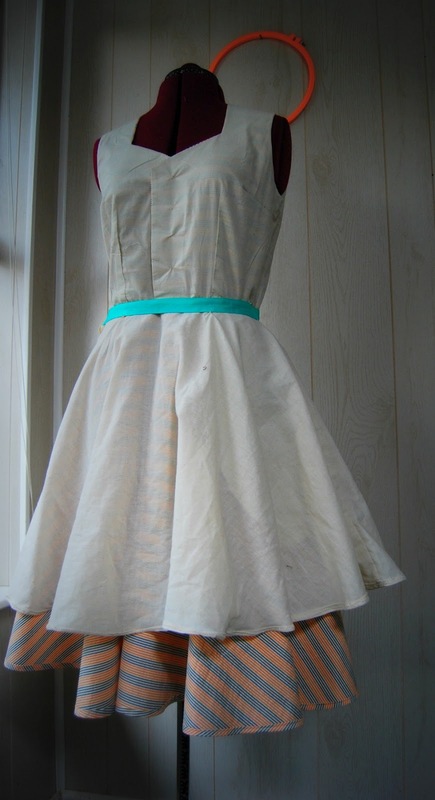 The skirt lining and shell were sewn as separate layers. I hemmed the lining as marked on the pattern, so beware that it's a little short- at least for my tastes. I lengthened the shell and hemmed it longer. I like the shorter layer being covered by the sheer longer layer. I saw a maxi dress on someone recently that was sheer but had a super short under skirt. I'd love to make something like that. Ooh, ignore that puckering. I blame the polyester for that. Or my shoddy sewing skills. I was pulling this off the machine ten minutes before I had to leave for the wedding I wore this to. In fact, I didn't notice it until I took these photos. I can't decide if I want to go back and fix it now. The flounce is my favorite part, of course. I love that it's a simple shaped dress with just a little something extra. I'd love to make it again one day in a stiffer fabric. Hooray for The Colette Sewing Handbook! I definitely recommend it. 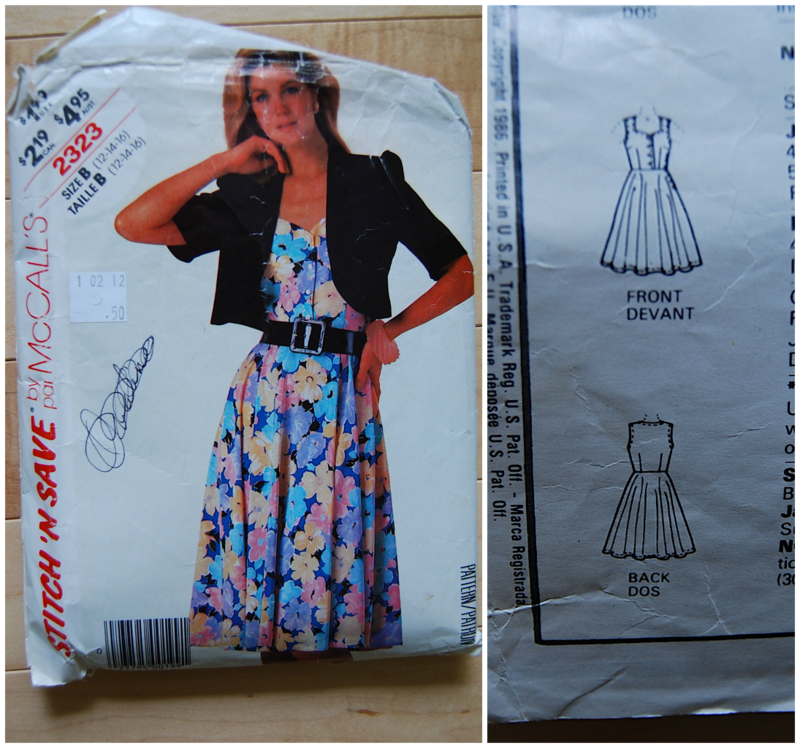 I think I'll have to tackle the Pastille dress next. Well, I managed to make two dresses last week. Two! I can't believe it. I was determined. Friends of ours got married over the weekend and I needed something for the rehearsal dinner, as well as the wedding. 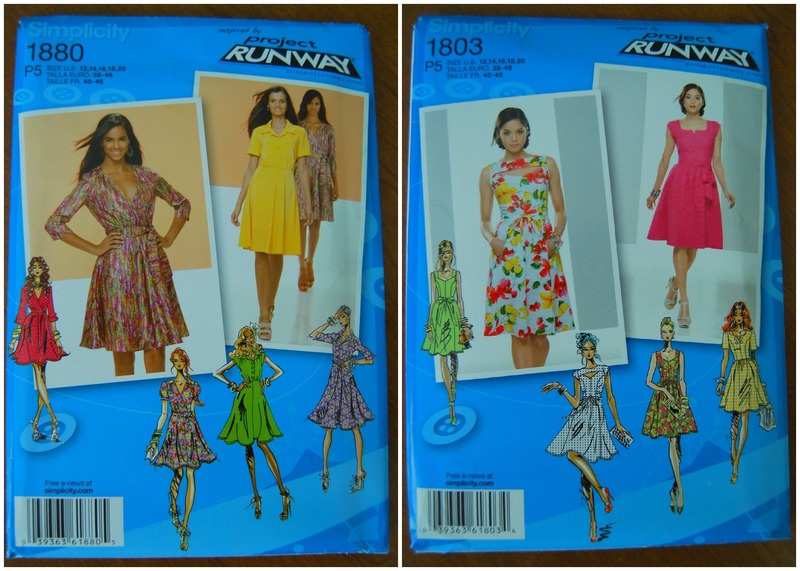 There's nothing like the fear of shopping for a dress to make one sew, right? This is the first dress I made, the one I wore to the rehearsal dinner. This particular dress was already planned out in my mind. Do you remember the muslin that I gave up on a while ago? 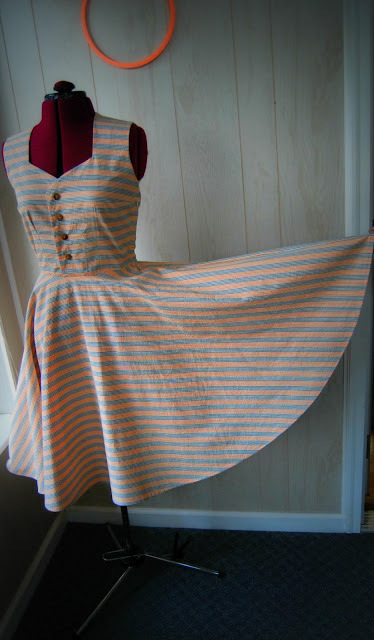 This is actually the dress I had in mind when I started that project. The fabric is cotton seersucker. I used a McCall's pattern from 1986. Doesn't really look like it's from the 80's, does it? I'm not really sure what made me buy it. I've never really been a fan of circle skirts on my own person. But I liked the idea of having a fitted bodice with a full back paired with a circle skirt. I guess I thought I'd give circle skirts another shot. And I really liked the button front and subtle sweetheart neckline. 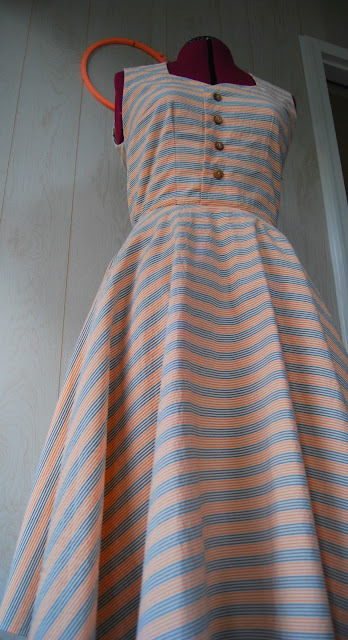 Of course if you rotated the pattern piece, the stripes would fall vertically in front and horizontally on the sides. The dress was super comfortable to wear. I was very happy with the fabric choice. Unfortunately, the fit was not the best, at least from behind. I'm not really sure what happened. I know my muslin didn't have major back issues like this. Could be that the seersucker was a much stiffer fabric. There is very little drape and some mechanical stretch. I also could have stuffed up the fit with my lining job. The pattern didn't originally call for a lining. It had those awful facings. I scrapped the facings and lined the whole dress with muslin. I did put a waist stay in, which I'm glad. 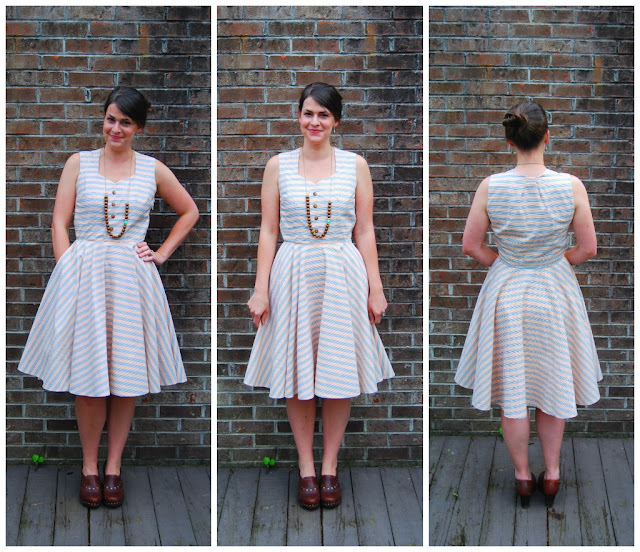 I think it definitely helped with the weight of the full circle skirt. I cut the skirt lining a lot shorter than the shell, mainly because I didn't have a lot of muslin to work with. It kind of acted as a petticoat. I think it gives the skirt a little more fluff. It was a fun dress to wear, even though I wasn't totally comfortable with the silhouette. There was a part of me that felt slightly costume-y. And, yikes, that back view looks pretty rough. I put in two neck darts to help with the fit. And some of those wrinkles in the photo are from the awkward way I'm standing. I shove my shoulders back when I take photos. In real life, I tend to hunch over. And yes, there's one pocket. One. I know that's a little ridiculous. I was planning on having two, but I could not figure out how to put in the other one around the side zip. I know there's a way, but I had a deadline. So I left one pocket in. I figured one is better than none. I made button holes, but in the end I didn't cut them open. I just stitched the buttons on through both pieces. I was worried about gaping. I'm so happy with the finish on this dress, I just wish the darn back fit better! I think I'm coming to grips with the fact that I need to draft my own bodice block. That it may be totally necessary for me. I had back fit issues on the second dress I made also. Actually, I always have back fit issues when I make dresses. Not so much with tops and blouses. Any idea why that could be? I suspect the fact that I've been ignoring that I might need a slight swayback adjustment may have something to do with it. 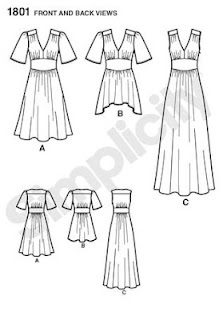 Has anyone out there drafted their own bodice block? Any good resources? I've been reading through Winifred Aldrich's Metric Pattern Cutting for Women's Wear. I think I'm going to start there. I think the Once Upon a Thread series that Katy puts on over at No Big Dill is my absolute favorite blog series around. 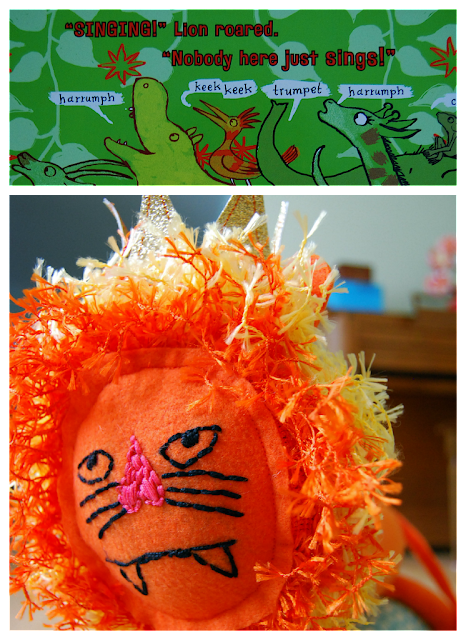 It combines so many things I love-- children's books, artwork and illustration, and sewing, of course. Anyway, I decided to play along again for chapter three. Though this time around, I tried something completely new to me. Softie, stuffie, plushie, stuffed animal- whatever you call it. And this softie is 3-D, which I'll explain more about later. 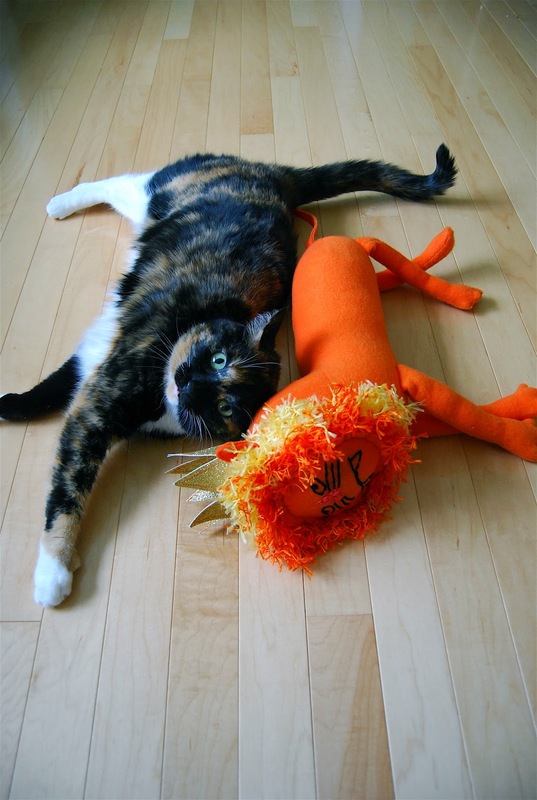 I know my lion is a little block-like. He's not the most sophisticated softie in the world. In fact, he's pretty ridiculous. But I'm awfully proud of how he came about. But first let me talk about how this all started. 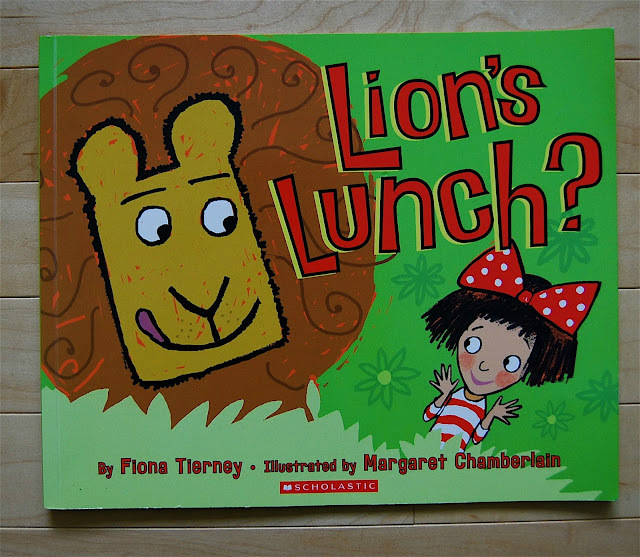 I read Lion's Lunch? by Fiona Tierney to one of my first grade classes the other day. I collect any sort of kid's book that has to do with art or drawing or anything like that. 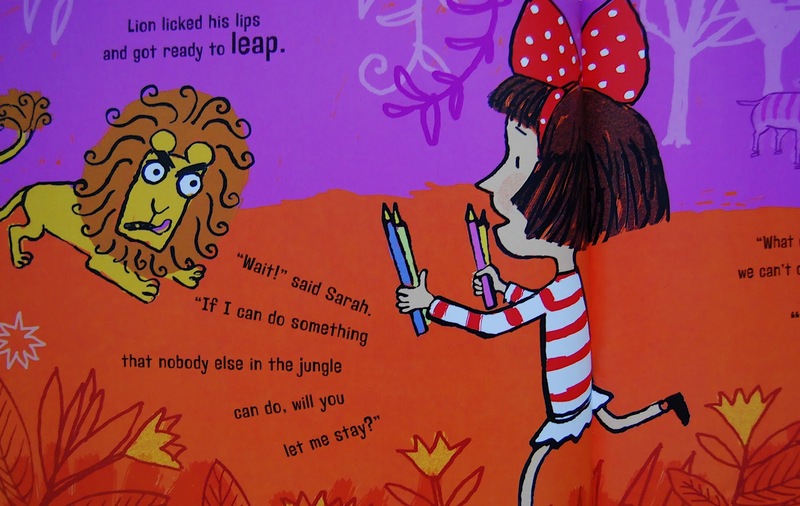 The story starts when Sarah wanders in to the jungle where she is accosted by an angry, grumpy lion. Lion is upset that Sarah is walking and singing in his jungle and tells Sarah he is going to eat her for lunch. Sarah pleads with lion not to eat her. She strikes a deal with lion that if she can do something no one else in the jungle can do, she can stay (and not be a lion's lunch). You'll have to read it to find out what happens in the end. 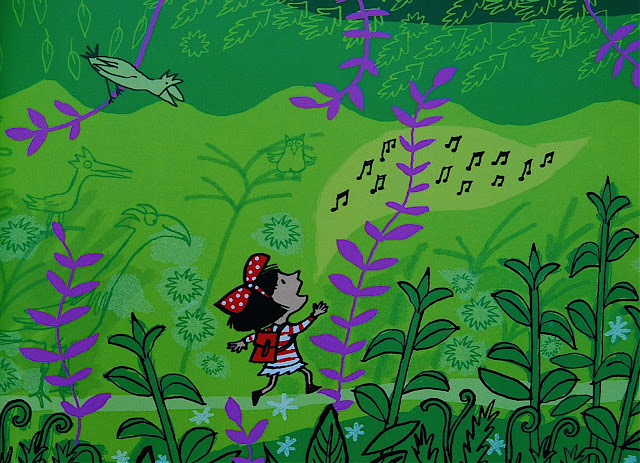 It's a cute story with very cute jungle animal illustrations. And Sarah draws and saves the day, which I like. 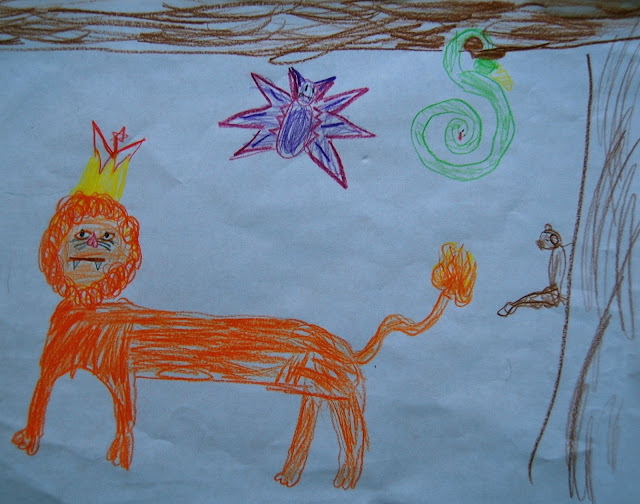 After I read the book, one of my first grade friends was inspired to draw some jungle animals just like Sarah. She drew this picture and gave it to me. It is the most awesome lion I have ever seen. You can totally tell that he's a grumpy lion, can't you? That expression. The upside-down-heart nose. I absolutely, positively LOVE kid's drawings. I know I'm in the right profession, being an art teacher. Kid's drawings have so much personality and style. They are totally fearless when it comes to art, something we adults should take note of. .... this fella was born. I giggled the entire time I was making this. Seriously. It was so much fun. At first I thought I'd make the lion more two dimensional by cutting out a front and back just like the drawing and stitching it up. Then I decided I wanted to be fancy. I wanted to make it three dimensional. But I was stumped on how to come up with a pattern. Are you ready for how I did this? I'm pretty stoked that it worked. It was just kind of brought forth from playing around. I wasn't too sure it would work out in the beginning. I made a very rough body and head shape out of newspaper and tape. We were just finishing up a paper mache project where we did just this to build an armature. 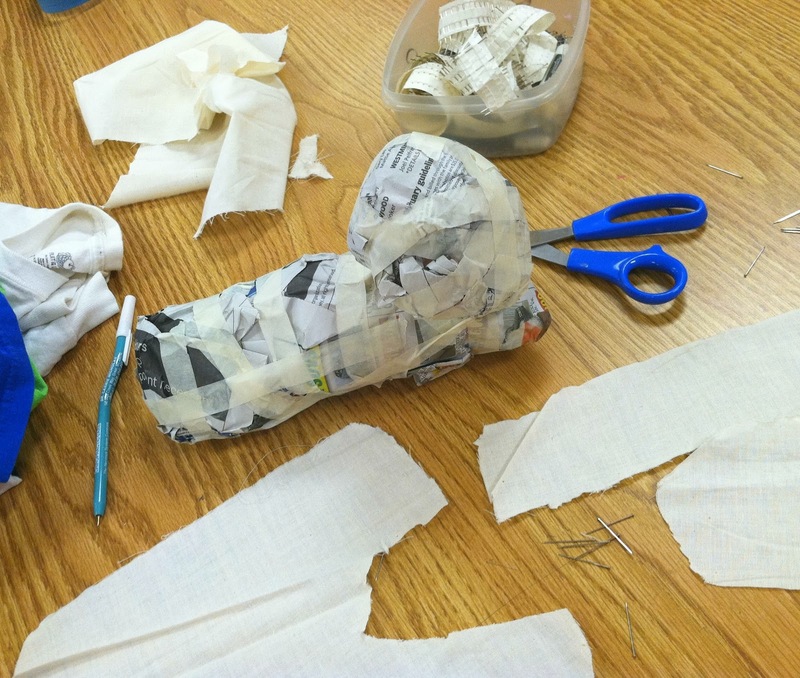 Then I used muslin and straight pins and I cut the pattern pieces by draping and pinning the muslin on my balled up newspaper body. See those scraggly looking pieces of muslin in the photo? They are the basic shapes. 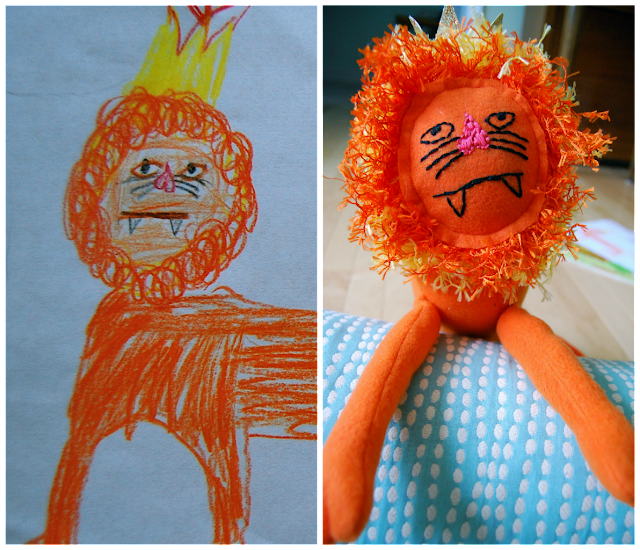 I refined and traced them out on paper, then used my paper pattern to cut the orange fleece. 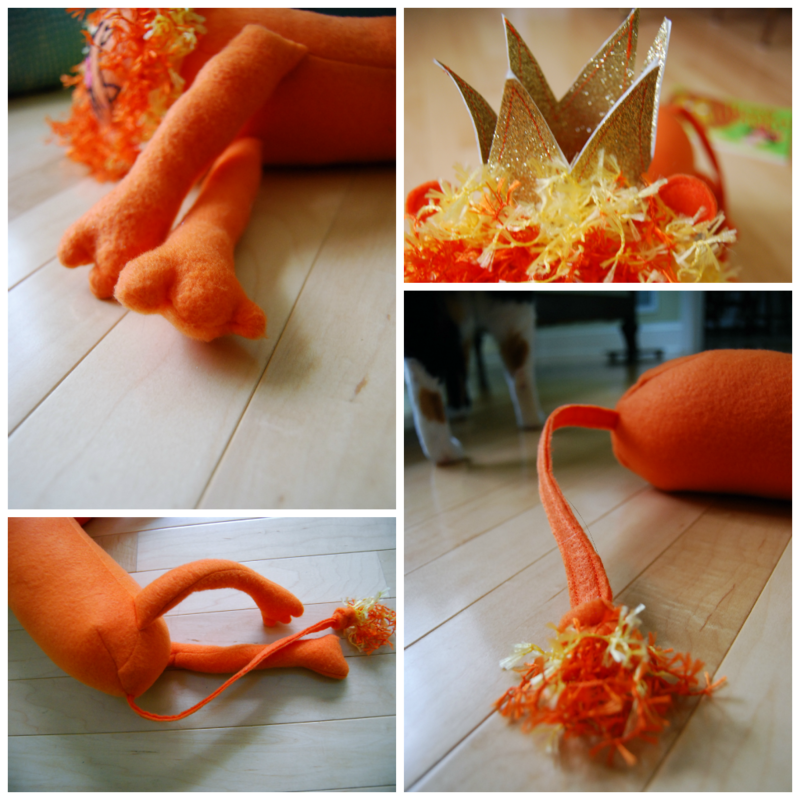 I made the body in two pieces so I would have seams to sew the legs and tail in to. I crossed my fingers and stitched it together. And it's a 3-D softie! You can see the seams pretty well in the photo above. 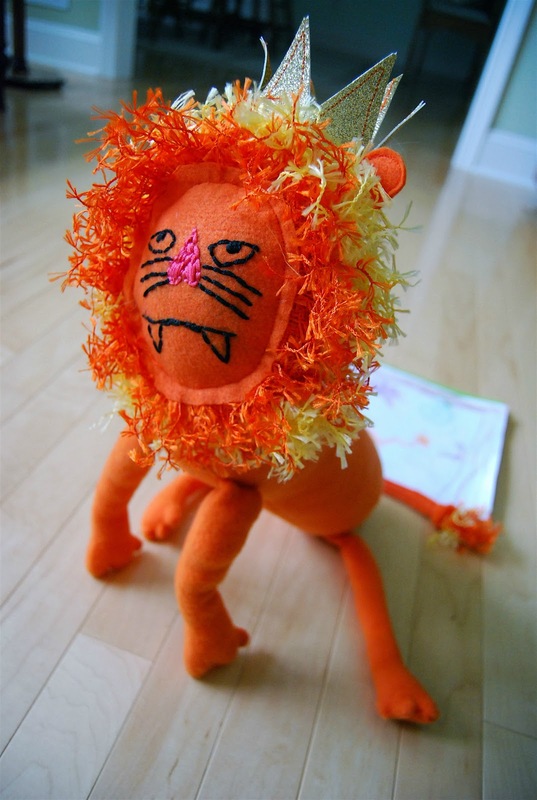 Now I know that my lion is pretty, um, square. He kind of has a block head. But I'm so pleased that working with a 3-d form to make the pattern worked. This is backwards from the way I'd normally create a pattern. And my experiences are pretty limited, mind you. Anyway, the possibilities are endless. 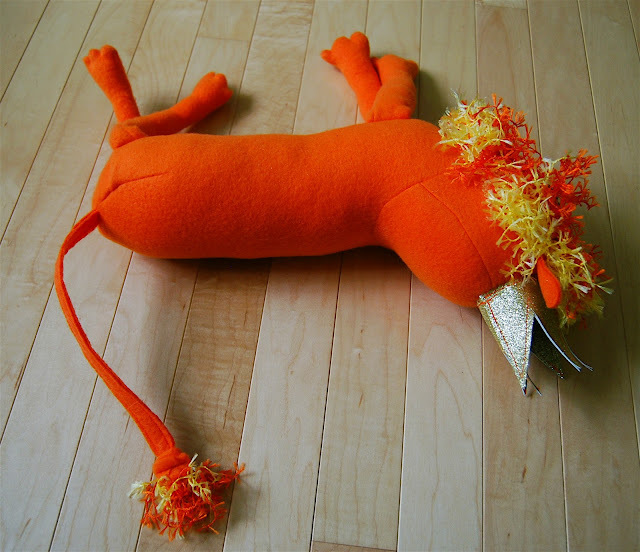 This lion is made from fleece. 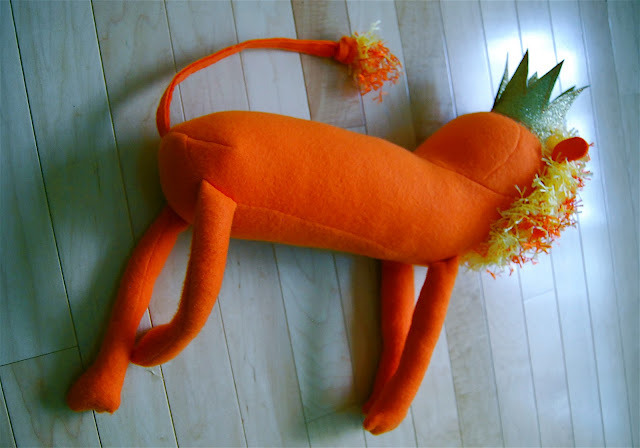 Fleece is very stretchy and forgiving, good for making softies. His face is actually felt. I embroidered his features. I found some crazy fluffy trim in the home decor section for his mane. His crown is a glittery vinyl I found at a craft store. It's sewn on by hand. Otherwise he's all machine stitched except for a little hole at his neck I slip stitched after he was stuffed. I used a poly-fill stuffing. Isn't he great? He's going to live on my bookshelf at school. He'll probably help read Lion's Lunch? to my first graders next year. Guess who else likes him? 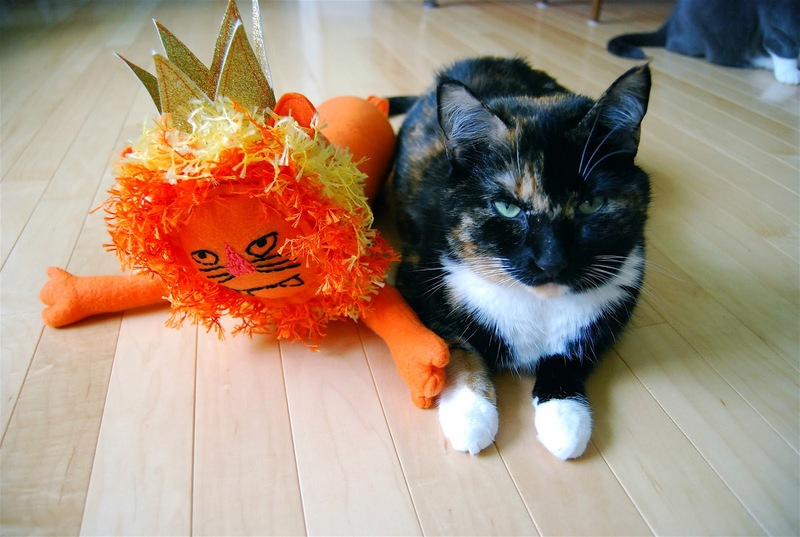 That is the same grumpy expression, is it not? Thanks Katy, for your ingenious series! I enjoy seeing what every one comes up with and discovering new books. So inspiring. Um, I pretty much failed at documenting Me Made May. I'm not even sure my attempt deserves a blog post, but here it is. And some general ramblings about it. If you'd like to see my sad flickr set, go here. 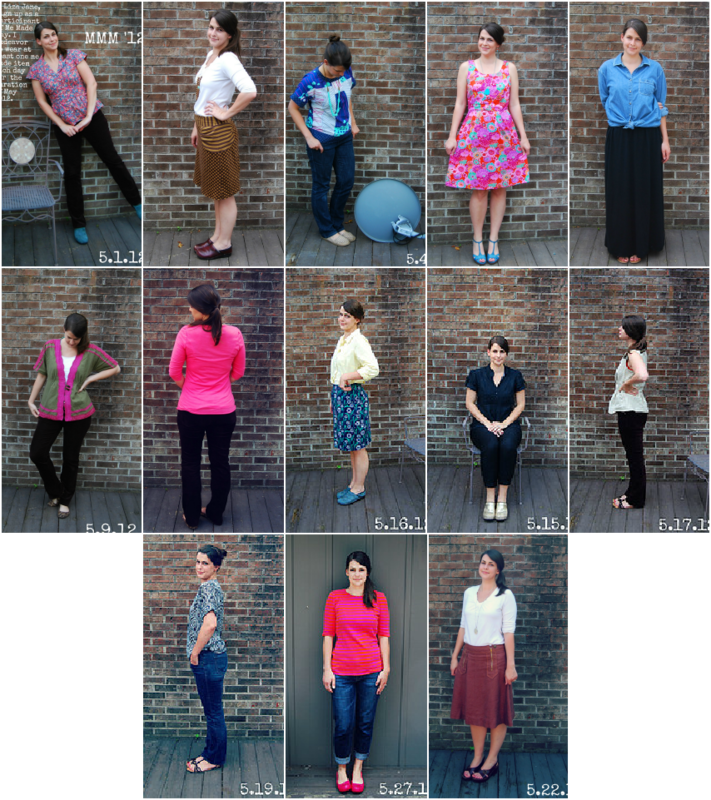 I did wear at least one me made item everyday, but I fell flat when it came to taking photos. And to be completely honest, I was kind of underwhelmed with my stuff. The weather really warmed up here. I brought out some of my summery stuff and I wasn't too excited about it. I dunno. I've been rather restless this month in general-- ready to be out of school for summer (still two more days...). What does that mean? Does it mean I need to spend my summer vacation sewing a brand new, exciting wardrobe?! Tell me yes, please. Enable away, friends. My new Liberty blouse wins extra points for being worn four times this month. Methinks I need more things made from Liberty ;). 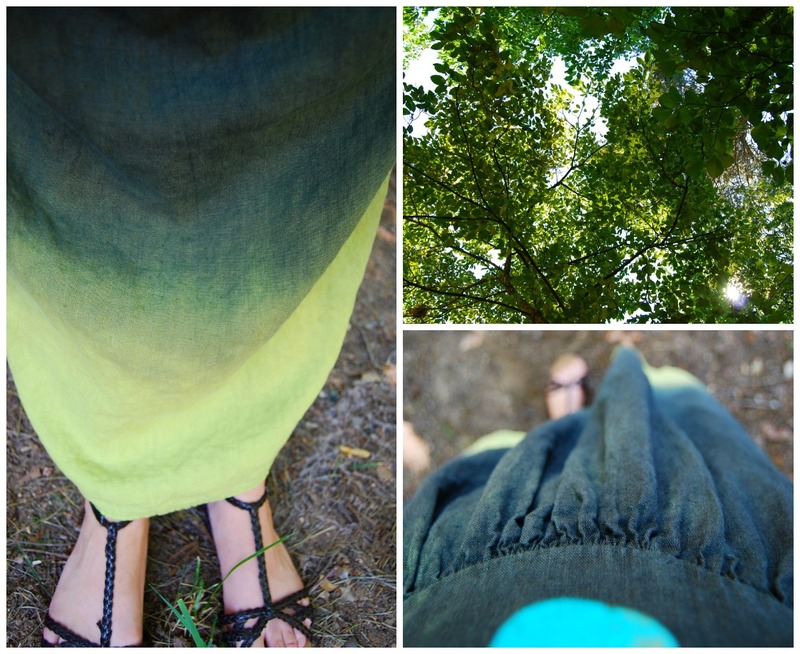 And all my quilting cotton skirts are very user friendly, especially in hot weather. And from my collage above- man, do you think I like pink? I never really thought of myself as a pink person.